Fourteen prison officers have been suspended in north London following allegations of corrupt behaviour. The governor of HMP Pentonville took action following claims of trafficking and "inappropriate relations", a Prison Service spokeswoman said. The jail is to "briefly reduce" its maximum number of inmates as a result with some prisoners being moved to other London prisons, she added. Prison Service director Phil Wheatley said corruption would not be tolerated. He said "appropriate disciplinary action" would be taken if necessary. The allegations are to be investigated by senior governors from other London prisons. The prison spokeswoman said: "If any alleged or otherwise suspected criminal activity is uncovered during the investigations relevant information will be passed to the police." There are currently 379 staff at Pentonville, with 139 on duty at any one time. Last month a leaked study by the Metropolitan Police and the Prison Service suggested at least 1,000 prison staff nationwide were corrupt - although it found most staff were honest. It also suggested more than 500 were involved in "inappropriate relationships" with prisoners. Chairman of the Prison Officers' Association, Colin Moses, said more stringent vetting of prison officers was needed and said problems were created by a policy of local recruitment. But he added that the suspended officers should be judged against the criminal test - beyond reasonable doubt - rather than on balance of probabilities. "Of course, if any wrongdoings are found we would expect that action be taken against these people," he said. 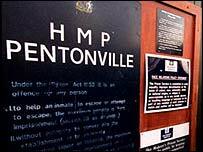 Pentonville, which can hold up to 1,177 prisoners, dates back to 1842.